Inside each project's view page you can obtain useful information about its progress and current status. > To be able to preview projects, your role as a user must have sufficient permissions. 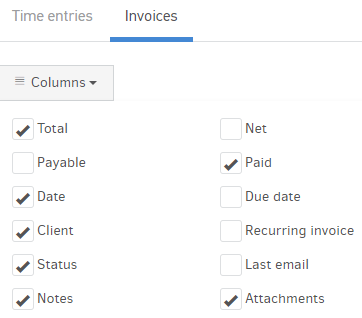 On the right side, you can select to Edit, Log time for the project, Invoice or view the project's History by clicking on the respective buttons. > For more details on invoicing a project, please refer to the related article. On the project's details you get information about the Client, its billing method (here, hourly rate) and the Client portal (CP) settings you have in place. Below, there is information about when it was created, modified and by whom. Total hours: This index illustrates how many hours you and your team have spent working on this project. Invoiced amount: If you have already invoiced this projects (partially or not), here you can see the total amount you have invoiced. Billed hours: The total hours that have been already invoiced. Unbilled hours: The total hours have not yet been invoiced. This graphic illustration gives you a quick insight of the tracked hours, depending on the period you will choose from the drop-down list. 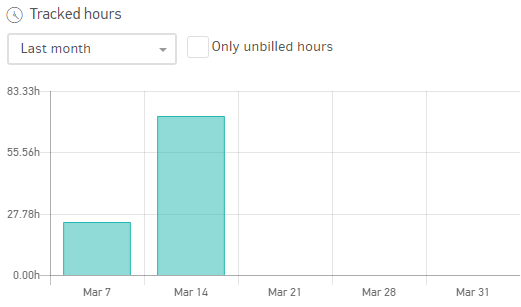 You may also choose to view a graph containing only the unbilled hours, by checking the related box. In this part of the project's overview you can see all the registered time entries sorted by period. You may also filter the time entries table by task, assignee and time entry status, as you can see in the picture below. If you click on the Invoices tab next to the time entries, you will see all the documents that have been issued so far for this project. From the Columns field, you can choose which ones will appear in this list for your convenience.